Eoin Cody shot eight points for the victors. 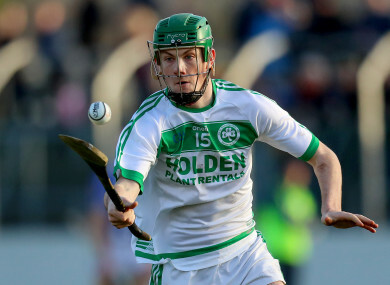 BALLYHALE SHAMROCKS ALL-Ireland winner Eoin Cody hit eight points (five frees and three from play) as St Kieran’s College reached their sixth Croke Cup final in a row this afternoon and ended CBC’s All Ireland journey. The 22-time winners never trailed from the eighth minute onwards but CBC pushed them all the way. Playing against the wind, the Cork school twice closed within a point during the second half. The Harty Cup runners-up had a goal disallowed before the break and created two chances for green flags on the resumption. A Patrick McBarron shot was only a whisker wide and an injury time free from goalkeeper Cian Long was deflected over the crossbar. Cody, David Blanchfield, Darragh Corcoran and Dean Mason came good for Kieran’s to set-up a rematch with Presentation Athenry on March 30. Four Cody points and three from Aaron Brennan left St Kieran’s 9-8 ahead at half time. CBC captain and top scorer Shane Barrett converted five frees. They trailed 8-5 after 25 minutes but Declan Hanlon effort, after a fine catch by the towering Niall Hartnett, and two Barrett dead balls levelled matters. They also had a goal ruled out in this period when Donnacha O’Callaghan ruled that Jack O’Kelly was in the square from a Cillian O’Donovan free. A David Blanchfield point in injury time snuck Kieran’s in front at the break. The Kilkenny side kicked on at the start of the second half with four points in succession. Cody was on target twice while Cian Kenny and Martin O’Connell also raised white flags to make it 13-8 by the 39th minute. CBC came back with four of their own however to bring it down to a point again entering the last quarter. Cody then left three defenders for dead to get a much needed score for the holders. Padraig Power narrowed the gap to one with five minutes remaining. Cian Long then saved with his feet from Cody before Conor Hoban pointed. Kieran’s added two more through Cody and Blanchfield and that was enough in an edgy finish. Scorers for St Kieran’s College: Eoin Cody 0-8 (5fs), Aaron Brennan 0-3, David Blanchfield, Martin O’Connell 0-2 each, Cian Kenny, Conor Hoban 0-1 each. Scorers for CBC Cork: Shane Barrett 0-7 (7fs), Kevin Finn, Padraig Power 0-2 each, Cillian O’Donovan, Declan Hanlon, Cian Long (f), Jack O’Kelly 0-1 each. Email “Fresh from Ballyhale's triumph, Cody hits 0-8 to guide St Kieran's into All-Ireland final”. Feedback on “Fresh from Ballyhale's triumph, Cody hits 0-8 to guide St Kieran's into All-Ireland final”.